It’s been a long time since I’ve reported on K-Pop Star 5, but I’m back! In order to not make it super long, I’m just going to briefly, very briefly (not that I give long explanations to things anyways, lol) let you guys now what is happening so far. Episodes 5-7 consists of more ranking auditions and a group showcase. Shall we get started? Joyce Lee – This girl has a voice and it is lovely and sassy and everything I wished I had in life. SPOILER (well, I guess not really): She was even better during the group showcase. 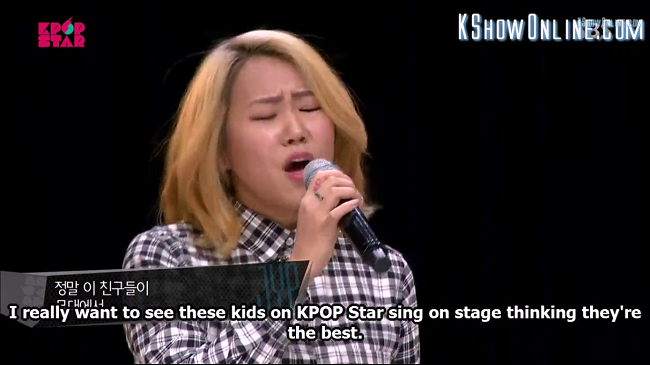 Lim Ha Eun – Okay, so this girl caught my eye, not because of her superior vocals, but because of her stage presence. I don’t think she’ll make it to top 10, but I do think she’ll get scouted pretty quickly. This video is only the audio of her singing “Bang Bang” and I promise you, if you get the chance to to find a clip with both video and audio, you’ll be impressed. Last season they skipped the showcase round, so I was surprised they brought it back. I personally like the showcase round just because we get a sneak peek at their groups. Sometimes if the judges don’t think the groups mesh well, they’ll rearrange some groups. After the latest episode, I think they might switch around at least a group or two. There were a lot of good performances (I’d show you some clips if the K-POP STAR YT CHANNEL WOULD ACTUALLY POST THE GOOD ONES). What I especially liked and appreciated about this episode is the fact that they really focused on camaraderie and growing because of their group members. They showed us great examples like with Joyce Kim, Denise Kim, and Kim Ye Rim’s group and they also showed groups that could try to learn more from each other, like Kim Young Eun and Seo Kyung Deok’s team. One emotional group performance was Jeon Ji Ae and Ryu Jin. Ryu Jin has an impressive singing record. She’s sung multiple CF songs including the Dae Han, Min Guk, and Man Se CF song. JYP revealed, honestly, that he thought she wouldn’t be able to get rid of singing habits and that it seemed impossible. He seemed really emotional and happy that she was able to overcome years of having that habit in just a few weeks time. She chose a partner who was the exact opposite of her, a partner she could learn from. I feel like the only people who ships these two more than me are the three judges themselves. Their performance has me convinced that they’re in love. Or maybe, they have very strong feelings for each other? This may not be true but this performance has me thinking otherwise. I mean just look at the way they look at each other while they were singing. LOOK. Tell me I’m not wrong. Okay, I’m done fangirling. In all seriousness, I’m super excited to see what they’re going to do next round. Actually, I’m really excited what a lot groups are going to show.